Villa Romar - Beautiful Villa in Costa Azul with Ocean View from every room. Located in the Costa Azul Montanas, Villa Romar is a newly constructed 2700 square foot home. We feature a private, expansive, and colorfully decorated courtyard, with the sounds of a tranquil waterfall and beautiful pool, and beautiful tropical gardens throughout. Overlooking the Sea of Cortez, our Villa provides a spacious living and entertaining area. Equipped with a beautiful gourmet kitchen and everything you need to prepare any meal. World class golfing, fishing, nightlife, and the #1 surfing spot in Los Cabos are only minutes away and can make your stay the experience of a lifetime. At Villa Romar, experience the tranquil, panoramic ocean view and delightful ocean breeze, of this spacious, luxurious, and charming near new 2700 square foot home. This ultimate getaway is only minutes from downtown San Jose Del Cabo and Cabo San Lucas. This Villa allows for relaxation as well a picturesque view from every room. All three rooms in the main house are equipped with an individually controlled air-conditioning unit. The living room has an high def TV and a BOSE entertainment system with wifi that is compatible with your smart phone. Additionally, there are speakers outside the home on the patio that are connected to the entertainment system so that you can enjoy your music even while swimming in the private pool or enjoying the sun in the lounge area. Wireless broadband Internet is also available for your convenience. Stepping into the main home you will notice a stellar spiral staircase that leads to the bedrooms, a sitting area, and the Master Suite. The Master Suite has a king size bed, a spectacular view of the Sea of Cortez from the balcony, as well as a full private bath. Downstairs you will notice the living room with a flat screen TV, dining room, laundry room, half bath, and a granite kitchen with a walk-in pantry and fully stocked with everyday appliances such a fridge, microwave, coffee maker, toaster, etc. 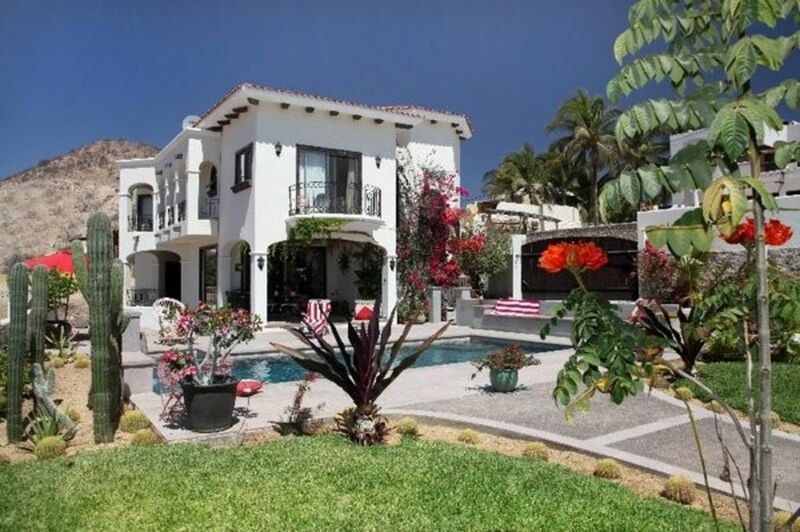 This dazzling Villa is only a 5 minute walk to a World Class surfing beach (Zippers), and a five minute drive to the One and Only Palmilla, which has top-notch golfing as well as a new shopping area. In addition, you can take a five-minute drive in bus or taxi to the downtown San Jose Del Cabo. The brand new marina Puerto Los Cabos is a 10-minute drive for those that are interested in going fishing. If your looking for more beaches, lands end, or even prime nightlife, Cabo San Lucas is only a 15 minute drive away. Short and long term rental are available. An additional guesthouse is available on the property for larger families, or couples who desire their own privacy while staying at the Villa (contact us for details). There is a bathroom that connects both suite 2 and 3.
land line telephone for local access calls only. Semi-private curbside parking offered up to 3 vehicles. Ample towels available to guests. Wifi available throughout the Villa. Basic seasonings are usually available. 60" hd smart tv with apple tv in master bedroom roku tv in casita with streaming wifi. Manicured tropical vegetation throughout the Villa, with grass areas from the pool area to the casita. Balcony outside kitchen area has bbq and patio furniture. Both areas have ceiling fans. Large entertaining patio located near living room area and pool with patio furniture. A beautiful pool to relax by, with natural cantarra stone deck, and ocean views. Relaxing, great location, great outdoor space! Gorgeous and spacious home, pictures don't do it justice! We stayed with three families, totaling 6 adults and 3 babies (~1yr). It is a great space to relax, enjoy the sun and cook. Enjoyed walking to Zippers beach, and quick car trips to downtown, the more kid friendly (swimmable) beaches as well as Flora Farms. The kitchen is well stocked with cooking tools and appliances, and the washer/dryer was key for the messy kids. Very responsive hosts leading up to and during the trip. That being said, wouldn't recommend the home for toddlers - lots of beautiful art, stone floors, sharp corners and breakables. Better suited for a mature crowd. We absolutely loved staying in this beautiful home. The outdoor area feels like heaven. So peaceful and beautiful! Interior was very clean and comfortable. We especially loved the gourmet kitchen. I would recommend renting a car as we had trouble getting an Uber and we were not sure how to get a taxi to the house. Also the pool was very cold I would recommend paying extra to have it heated for you. Though we were informed it would be soon getting a solar heater. All in all very happy with this home and would love to rent again. We first stayed at Villa Romar 4 years ago and loved it then, so we were surprised to find it had actually improved since then. There are many great, thoughtful additions, including comfortable sitting areas all over the grounds, which are lovely in themselves. It is the most comfortable and roomy house we've been in, and the location is just perfect. Being able to walk to beach every morning is really great, and the neighborhood is very peaceful & feels safe.. The owners couldn't have been more helpful, and responded quickly to all my questions. Thank you ; we hope to come back soon!! The villa was in the perfect spot. Easy drive to/from the airport. Easy drive or walk to the beach. Easy drive to downtown San Jose del Cabo, amazing grocery stores, One and Only resort, and fabulous Farm to Tables outside the city. If you’re reading this review, book this villa. It’s absolutely stunning. Incredible home and an ideal getaway! Can't say enough about how wonderful this home is. It feels like your own private resort, incredibly comfortable and quiet with luxury all around. The home is very well stocked, with all items you might need in the kitchen to make any meal, higher end appliances and cookware. The master bed was very comfortable and big. Maria and Rob have furnished the home beautifully and all of the furniture is updated and well kept. When we were there is was in the low 80's but we still paid for the pool to be heated, which was completely worth it as we could swim after the sun went down. This is a very private home, neighbors are a good distance away and very few rooms have a direct line to them. Maria and Rob were both attentive and responsive, we felt very taken care of. I would highly recommend this home and would stay there again. Thank you Rob and Maria!